I came up with this and wanted to make sure I've got it right. I am only capturing the a-z. Do I have that right? And more importantly, what do you think? While it is true that asking regexes to parse arbitrary HTML is like asking a beginner to write an operating system, it's sometimes appropriate to parse a limited, known set of HTML. If you have a small set of HTML pages that you want to scrape data from and then stuff into a database, regexes might work fine. For example, I recently wanted to get the names, parties, and districts of Australian federal Representatives, which I got off of the Parliament's web site. This was a limited, one-time job. Regexes worked just fine for me, and were very fast to set up. Also, scraping fairly regularly formatted data from large documents is going to be WAY faster with judicious use of scan & regex than any generic parser. And if you are comfortable with coding regexes, way faster to code than coding xpaths. And almost certainly less fragile to changes in what you are scraping. So bleh. @xiaomao that works for spaces, but newlines are also valid within XML elements. @CharlesDuffy \s matches space, tab, form feed, carriage return, line feed, and possible more. Unless you are using multi-line mode it works. @xiaomao nod -- multi-line mode (default in many environments) was the point. Also, note that you've focused only on whitespace -- the smallest and easiest objection -- and ignored the rest. @CharlesDuffy If it's the default you can always disable it... If I was to use this kind of regex I will disable it. Plus it's disabled by default in many programming languages. For entities I can decode them, for other weird stuff I use regex to filter them out. And this is not the kind of thing to argue, because 1.it won't stop and 2.it works for me. @xiaomao indeed, if having to know all the gotchas and workarounds to get an 80% solution that fails the rest of the time "works for you", I can't stop you. Meanwhile, I'm over on my side of the fence using parsers that work on 100% of syntactically valid XML. I once had to pull some data off ~10k pages, all with the same HTML template. They were littered with HTML errors that caused parsers to choke, and all their styling was inline or with <font> etc. : no classes or IDs to help navigate the DOM. After fighting all day with the "right" approach, I finally switched to a regex solution and had it working in an hour. Using regex on a large page to get all the data in a large table is much faster than using xpath..
@CharlesDuffy: definitely less fragile. When the third-party changes their html, they are much more likely to change the structure (breaking your xpaths) than the leaf nodes you are scraping. Scraping is not parsing. Scraping is pulling specific bits of data from a puddle of designer contaminated crap you don't care about. You DO NOT WANT to parse that puddle. You want to do only the absolute minimum amount of "parsing" that will get you your data. You don't CARE about the structure. You care about your bits of data. @CharlesDuffy you're talking about XML parser, since when an XML parser can read a HTML page? Have you ever tried to load a random webpage from the Internet via an XmlParser (class in an arbitrary language)? I would take it to the level, that probably it's possible that even some W3C valid XHTMLs would fail using XML parsers... look at this page's source for example meta name="twitter:card" is not closed, neither the <link>s. @SebastianGodelet which will be impossible to parse if the original was non-compliant. The key point for me is that XML parsers can't parse actual web pages found in the wild. A single <p> with no matching </p> will crash all the XML parsers I've used. I'm sure whoever has to maintain or extend your regexes wished you used a proper xml parser, regardless of the speed. It's not that much slower and I guarantee the code will tend to be much more readable and extensible. A much more sensible way of looking at things. Please can we upvote this one. Yes, a parser is better for a lot of jobs, but then it's not always best. As with most programming, there's never just one right solution. Use your brain. regexes are often less fragile, because xml formats may change , but the semantic nature of the underlying data often does not. xml is, more often than not, used as a proxy for structure, where no real structure exists. @CharlesDuffy parsing even some limited subset of HTML is a bad idea indeed, but I guess that Kaitlin used the word parsing by mistake as later he wrote about scraping (extracting I guess) some data from a document (just like the original question). If the data you want extract is a regular language you can extract it from a larger document that is not. in fact context-free parsers use REs to convert a document into a string of lexemes/tokens first. I suppose that data from the original question is regular, but I don't know the structure of xml/html well enough to say for sure. The first answer is pure FUD and incorrect. RegEx is not limited to handling regular languages only: rexegg.com/regex-vs-regular-expression.html Yes, you should be careful as you should in any parsing/scraping scenario. But if you're afraid of the details, you shouldn't be touching problems like this in the first place. @ErikReppen Nope. And forget when HTML elements can be commented out. Trying to work with HTML using regex is categorically a bad idea. @jpmc26 Well you could start by splitting your comments and html strings in script tags out just as you would have to with any parsing/scraping approach required when using an actual HTML DOM rendering parser approach wasn't ideal. Establishing that it requires more than one step to use a tool doesn't invalidate its use. At everybody-else, nor does repeating something that hasn't been true since the '80s, which is that RegEx can only handle "regular language" parsing. @ErikReppen I wouldn't recommend anyone who doesn't already know the principles of text analysis try that. Sure, there might be 0.01% of cases where using regex to extract data from HTML might make sense. But if you actually know how to tell the difference, you're not going to be blindly plopping a, "How do I parse HTML with regex?" question on SO. At most, you might run into a specific problem while implementing your own, more efficient parser and should have the skills to explain clearly why just using an existing HTML parser won't work or wasn't efficient enough for you. @ErikReppen Also, writing an HTML parser in pure regex is literally insane. Regular expressions are designed for and work best against regular languages. The extensions allow for modest modifications in clear cut cases that are just beyond normal regular languages, not for developing a complex parser for something as intricate as HTML. @jpmc26 RegEx hasn't been limited to regular languages since the mid-'80s. That said, no, probably not an awesome choice for something like an actual web browser parser. @ErikReppen I didn't say it was limited to regular languages. I did, however, debunk the notion that the top answer is "pure FUD," because the chance of regular expressions actually working properly against any HTML outside of your direct control is nil. Using a proper HTML parser should be your default, because it's not going to trip over constructs you didn't notice or think of. Only if it's not fast enough for you or something should you even consider a different approach. Also: in perl at least, worst case, you can set the e flag to evaluate. So you could use a proper parser in your regex. @jpmc26 But it becomes strawman-ish when you associate all regex/html-related questions with the task of actually writing a web brower's HTML parser. If you are assuming that no HTML can be missed or misread or it's mission-catastrophic-failure, I agree with you. But what % of use cases for questions like this actually apply? I regularly return to this answer because somebody who knows less about the subject matter than I do has linked to it because they're trying to tell me that I can't do what I've already done, which is write link-auditing and inline-css search tools for cms sites. @ErikReppen I did no such thing. Instead, I'll flip the tables on you. How many of these questions actually specify that the answer doesn't have to work for arbitrary HTML and then specifically indicate what subset of HTML they can work within? Someone who understands the difficulties that their task entails would be able to do so. As for your tools, if you need speed, write a simpler parser, or if you are willing to accept failure in certain cases, sure, use regex. But I sure hope you tried real HTML tools before you resorted to that. Needlessly giving up reliability is just bad software. So far I haven't come across as what is not possible to parse in HTML. Can someone show/point me to the actual example? I really want to experience it. @Koder101 It's because the text can be nested to arbitrary levels and it changes its meaning when nested inside other elements. So example problem snippets are, <script>var s = "<div>Hi, mom</div>"</script>, <div><div>Hi, mom</div></div>, and <!-- <div>I'm just a comment</div> -->. It also doesn't help that the same elements can take different forms, like <br> is <br/> and <a></a> is <a/>. These are constructs that are at best unreasonably difficult to handle with just regex. I think the flaw here is that HTML is a Chomsky Type 2 grammar (context free grammar) and RegEx is a Chomsky Type 3 grammar (regular grammar). Since a Type 2 grammar is fundamentally more complex than a Type 3 grammar (see the Chomsky hierarchy), it is mathematically impossible to parse XML with RegEx. But many will try, some will even claim success - but until others find the fault and totally mess you up. The OP is asking to parse a very limited subset of XHTML: start tags. What makes (X)HTML a CFG is its potential to have elements between the start and end tags of other elements (as in a grammar rule A -> s A e). (X)HTML does not have this property within a start tag: a start tag cannot contain other start tags. The subset that the OP is trying to parse is not a CFG. In CS theory, regular languages are a strict subset of context-free languages, but regular expression implementations in mainstream programming languages are more powerful. As noulakaz.net/weblog/2007/03/18/… describes, so-called "regular expressions" can check for prime numbers in unary, which is certainly something that a regular expression from CS theory can't accomplish. @LarsH, that may be strictly true, but only if you can depend on well-formedness. To be able to reliably parse even start tags one would have to accommodate a number of workarounds for (X)HTML syntax errors implemented in real world user agents, and even then probably cross fingers and pray. @eyelidlessness: the same "only if" applies to all CFGs, does it not? I.e. if the (X)HTML input is not well-formed, not even a full-blown XML parser will work reliably. Maybe if you give examples of the "(X)HTML syntax errors implemented in real world user agents" you're referring to, I'll understand what you're getting at better. @AdamMihalcin is exactly right. Most extant regex engines are more powerful than Chomsky Type 3 grammars (eg non-greedy matching, backrefs). Some regex engines (such as Perl's) are Turing complete. It's true that even those are poor tools for parsing HTML, but this oft-cited argument is not the reason why. You are correct, I just want to drop this: You can write a finite state-machine that is equivalent to any regex expression (finite state-machines are equivalent in power to Type 3 languages.) But to parse HTML you need memory, there is this thing called pushdown automaton that is basically an state-machine with a stack to store values. That can be used to parse HTML, unfortunately it is pretty hard to describe a pushdown automaton in text language (like you can represent state-machines in regex,) it is easier to program it yourself. I used regex for a long time before learning the theory and when I was first told you can't parse things with regex I said that was nonsense which is kind of true, it depends what you mean. Language is ambiguous. 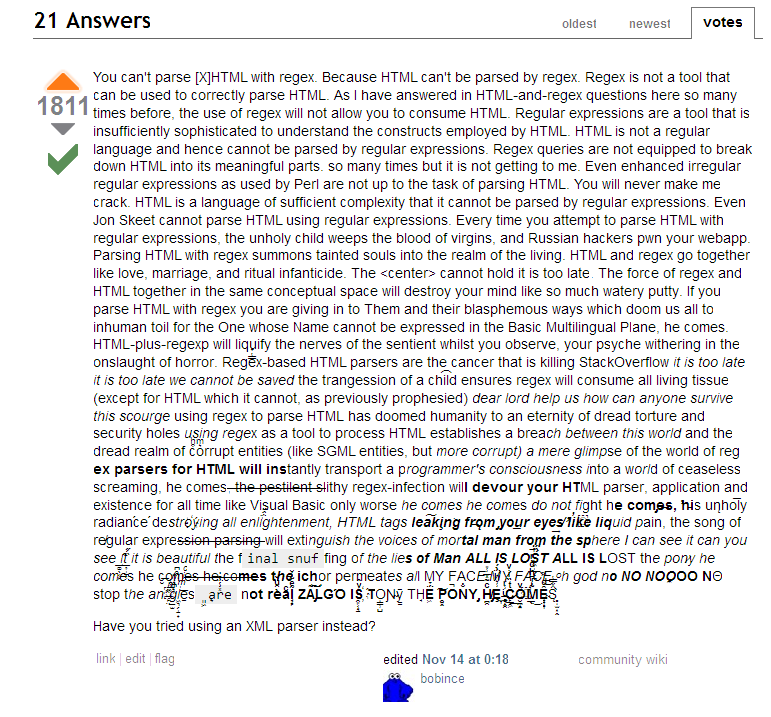 You can't parse HTML using only regex. I was using regex but additionally with functions that provided the higher level elements for parsing such as maintaining a stack of the current nesting. I wouldn't try using regex alone for parsing anything complex even if it had added features to make it possible. However, you are on the right track. Since HTML is a Chomsky Type 2 language, then to parse a Chomsky Type 2 language you generally need a stack capability within the parsing language(to track context). Regex doesn't have stack management capability: not because it is a Chomsky Type 3, but simply because the language was not designed with that capability. With some support for some extended constructs like recursion, it is possible in Regex, but would not be easy. Just as HTML lacks any capabilities to parse other languages, Regex lacks a stack capability needed to parse HTML. FWIW HTML is not context-free (although the ways in which it is not are not relevant to this problem). For example, you cannot have unique ids in a context-free grammar. RegEx hasn't been limited to regular languages for 30 years now. @Tgr IDs as in the HTML attribute are not unique. They should be used like that, but you can use IDs instead of classes without problem (ignoring the added specifcity). You can use an arbitrary string as HTML without problem, for some definition of "without problem" - browsers will mangle it into valid HTML and process for doing that is even fairly well-defined and standard these days. But valid HTML as a language is not context-free. Work out the Traveling Salesman Problem in O(log n) or less. If it's any more than that, you'll run out of RAM and the engine will hang. The pattern will be pretty big, so make sure you have an algorithm that losslessly compresses random data. Almost there - just divide the whole thing by zero. Easy-peasy. I haven't quite finished the last part myself, but I know I'm getting close. It keeps throwing CthulhuRlyehWgahnaglFhtagnExceptions for some reason, so I'm going to port it to VB 6 and use On Error Resume Next. I'll update with the code once I investigate this strange door that just opened in the wall. Hmm. P.S. Pierre de Fermat also figured out how to do it, but the margin he was writing in wasn't big enough for the code. Divison by zero is a much easier problem than the others you mention. If you use intervals, rather than plain floating point arithmetic (which everyone should be but nobody is), you can happily divide something by [an interval containing] zero. The result is simply an interval containing plus and minus infinity. @rjmunro I feel that using intervals for arithmetics is something awesome, but I've never seen it before. Do you mean en.wikipedia.org/wiki/Interval_arithmetic ? Fermat's small margin problem has been solved by soft margins in modern text-editing software. @rjmunro Interval aritmethic (Wikipedia): Division by an interval containing zero is not defined under the basic interval arithmetic. FYI: Fermat's problem has actually been solved in 1995, and it only took mathematicians 358 years to do so. I do all of your steps, except my algorithm for TSP is O(log log n) ,how could I make that O(log n) ? It seems pretty clear to me that Fermat had one of the incomplete solutions in mind... Yet another instance of "eye-witness" testimony being unreliable. That algorithm is not quite correct. It should contain step 2.5.: Determine the smallest positive integer for which the recursive process of halving (whenever even), or tripling-plus-one (whenever odd), fails to terminate at unity. I was able to bypass that sticky divide-by-zero step by instead using Brownian ratchets yielded from cold fusion...though it only works when I remove the cosmological constant. I got past step #5, but the Zenobytes showed up. Stay away from that pandora's box. There's no need to mock the user for asking. (If he had known that it can't be done, he wouldn't ask the question in the first place.) It is correct that HTML or XML can't be parsed with regular expressions proper. That's a mathematical fact; trying that is a mathematical equivalent of building a perpetual motion. But actual implementations of regular expressions are stronger than regular expressions proper; they allow backreferences. A user here has written an XML parser using regular expressions, simply to prove that it can be done. (I haven't tested it, but I have no reason to doubt him.) But the expression is huge and probably highly inefficient. The lesson is: just because something can be done, it doesn't mean that it should. Fine, <span title=\'highlight the "punch"\'>thanks<span>. "unpretty" attributes with a space before the "=" symbol, after it and both before and after it. Should you find something which does not work in the proof of concept above, I am available in analyzing the code to improve my skills. the delimiter of the attribute value, a single or double quote ('|"). In the pattern, the single quote is escaped because it coincides with the PHP string delimiter. This sub-expression is captured with the parentheses so it can be referenced again to parse the closure of the attribute, that's why it is very important. the attribute sub-expression ends here, with the specification of zero or more possible occurrences, given by the asterisk. Then, since a tag may end with a whitespace before the ">" symbol, zero or more whitespaces are matched with the \s* subpattern. The tag to match may end with a simple ">" symbol, or a possible XHTML closure, which makes use of the slash before it: (/>|>). The slash is, of course, escaped since it coincides with the regular expression delimiter. Small tip: to better analyze this code it is necessary looking at the source code generated since I did not provide any HTML special characters escaping. Does not match valid tags having attributes with no value, i.e. <option selected>. Also does not match valid tags with unquoted attribute values, i.e. <p id=10>. @ridgerunner: Thanks very much for your comment. In that case the pattern must change a bit: $pattern = '/<(\w+)(\s+(\w+)(\s*\=\s*(\'|"|)(.*?)\\5\s*)? )*\s*>/'; I tested it and works in case of non-quoted attributes or attributes with no value. How about a space before the tag name: < a href="http://wtf.org" > I'm pretty sure it is legal, but you don't match it. NO sorry, whitespaces before a tagname are illegal. Beyond being "pretty sure" why don't you provide some evidences of your objection? Here are mine, w3.org/TR/xml11/#sec-starttags referred to XML 1.1, and you can find the same for HTML 4, 5 and XHTML, as a W3C validation would also warn if you make a test. As a lot of other blah-blah-poets around here, I did not still receive any intelligent argumentation, apart some hundred of minus to my answers, to demonstrate where my code fails according to the rules of contract specified in the question. I would only welcome them. @ridgerunner of course your comment was intelligent and welcome. There are people that will tell you that the Earth is round (or perhaps that the Earth is an oblate spheroid if they want to use strange words). They are lying. There are people that will tell you that Regular Expressions shouldn't be recursive. They are limiting you. They need to subjugate you, and they do it by keeping you in ignorance. You can live in their reality or take the red pill. Like Lord Marshal (is he a relative of the Marshal .NET class? ), I have seen the Underverse Stack Based Regex-Verse and returned with powers knowledge you can't imagine. Yes, I think there were an Old One or two protecting them, but they were watching football on the TV, so it wasn't difficult. The options to set is RegexOptions.ExplicitCapture. The capture group you are looking for is ELEMENTNAME. If the capture group ERROR is not empty then there was a parsing error and the Regex stopped. If you are unsure, no, I'm NOT kidding (but perhaps I'm lying). It WILL work. I've built tons of unit tests to test it, and I have even used (part of) the conformance tests. It's a tokenizer, not a full-blown parser, so it will only split the XML into its component tokens. It won't parse/integrate DTDs. Good Lord, it's massive. My biggest question is why? You realize that all modern languages have XML parsers, right? You can do all that in like 3 lines and be sure it'll work. Furthermore, do you also realize that pure regex is provably unable to do certain things? Unless you've created a hybrid regex/imperative code parser, but it doesn't look like you have. Can you compress random data as well? Don't try it! If you do, the entire internet will be compressed to a quantum singularity and sucked down the rabbit hole! Sir, I'm convinced. I'm going to use this code as part of the kernel for my perpetual-motion machine--can you believe those fools at the patent office keep rejecting my application? Well, I'll show them. I'll show them all! Does it work for <foo bar="baz > quux">? Because that is in fact valid. So is stuff like <foo bar='"baz" > \'quux\''>. There's a LOT of stuff that looks "wrong" but is still valid XML. @justin The second one is illegal, you can't escape the quotes with a \ . The first one will work if you close the foo. Huh, looks like I stand corrected on that one. Fair enough. The basic point is more or less the same, though: Just because you haven't figured out how to break it yet, that doesn't mean it always works. And if it doesn't always work, what's the point? An HTML parser will be more practical AND catch everything. @Justin So an Xml Parser is by definition bug free, while a Regex isn't? Because if an Xml Parser isn't bug free by definition there could be an xml that make it crash and we are back to step 0. Let say this: both the Xml Parser and this Regex try to be able to parse all the "legal" XML. They CAN parse some "illegal" XML. Bugs could crash both of them. C# XmlReader is surely more tested than this Regex. @JacobStanley No I did them by hand. While the Xml standard is written in pseudo-regex it can't be directly translated. You have to prioritize some parts over others to obtain a parser, so you need the human hand. The .NET regular language does span XML, and so you can tokenize XML with a .NET regular expression. Tokenization and parsing are very very far from the same. The above regex will accept <A><B><C></B></C></A> (I presume). It is a valid sequence of Xml tokens. This string is in the language of XML tokens. It is not in the language of XML, but that doesn't mean it cannot be tokenized. Just because you cannot parse something doesn't mean that it can't be tokenized. LR(0) parsers can't parse binary strings "00011", but the regex * sure can tokenize them. LR(0) can't parse them because they are left recursive, btw. @MichaelGraczyk I remember correctly, the above regex won't accept <A><B><C></B></C></A>. It is a stateful tokenizer, not a stateless tokenizer. In that case, it isn't a regular expression proper. If it uses backtracking at all, or for whatever reason cannot be expressed in terms of empty strings, literals, and the empty set with concatenations, alternations, Kleene stars thereof (inductive concatenations), then it isn't formally regular. A lot of people here seem to think that all "regular expressions" are true, formal regular expressions. It's true that Thompson NFA regular expressions are not true regular expressions, and are not recursive. However, PCRE regex is not truly regular, and hence can be recursive. Of course, you never said that it was a proper regular expression. You just accurately stated that it would tokenize XML. @ShaquinTrifonoff - Then it's not actually random. I think your idea of random data is different from mine. @JustinMorgan - You're right. I was thinking of 'normal' random numbers produced by the browser - see Temporary User Tracking In Major Browsers. That document was originally here, but has since been removed. This isn't regex, this is full blown parser! While it's perfectly fine to tokenize bits of string by regex, you need some functions around that to make it into a real parser, and that's exactly what this is. By "parsing html with regex", I imagine regex-only-"parser", which is obviously impossible. This is just C# parser that uses regexes every now and then, not regex parser. huh... I decoded the Base64 using an online decoder... I was expecting more satire - or at least some sarcasm - but all I saw was seemingly random characters... did I do wrong? do I need to compile it or something? or am I disappoint? In this 'verse, there are many nodes that attempt to deceive you with their logic. But there is another verse... a darker verse. In the Regex 'verse, you keep what you ExplicitCapture. The source link is broken (snipt.net/xanatos/regex-to-tokenize-an-xml) - could you please reupload somewhere? for parsing multiple files at once, see: How to parse hundred html source code files in shell? I’m afraid you did not get the joke, @kenorb. Please, read the question and the accepted answer once more. This is not about HTML parsing tools in general, nor about HTML parsing shell tools, it’s about parsing HTML via regexes. @Palec I don't get the joke either. Is it nearly impossible to parse HTML with regex? No, @Abdul. It is completely, provably (in the mathematical sense) impossible. @Palec Is that mathematical sense in relation to VladGudim's answer on the grammar types? Or something else? Yes, that answer summarizes it well, @Abdul. Note that, however, regex implementations are not really regular expressions in the mathematical sense -- they have constructs that make them stronger, often Turing-complete (equivalent to Type 0 grammars). The argument breaks with this fact, but is still somewhat valid in the sense that regexes were never meant to be capable of doing such a job, though. And by the way, the joke I referred to was the content of this answer before kenorb's (radical) edits, specifically revision 4, @Abdul. The funny thing is that OP never asked to parse html using regex. He asked to match text (which happens to be HTML) using regex. Which is perfectly reasonable. It matches the types of tags you mentioned, while ignoring the types you said you wanted to ignore. I think you mean \/> instead of \\>. No, just \> is what I meant; I never meant to edit the regular expression of my original post. I sometimes escape unnecessarily when I'm unsure if something is special character or not. I've edited the answer; it works the same but more concise. Looking at this now, I don't know why I thought you meant \/, since that would do the exact opposite of the requirements. Maybe I thought you were offering a negative filter pattern. I agree that the right tool to parse XML and especially HTML is a parser and not a regular expression engine. However, like others have pointed out, sometimes using a regex is quicker, easier, and gets the job done if you know the data format. Microsoft actually has a section of Best Practices for Regular Expressions in the .NET Framework and specifically talks about Consider[ing] the Input Source. Regular Expressions do have limitations, but have you considered the following? The .NET framework is unique when it comes to regular expressions in that it supports Balancing Group Definitions. For this reason, I believe you CAN parse XML using regular expressions. Note however, that it must be valid XML (browsers are very forgiving of HTML and allow bad XML syntax inside HTML). This is possible since the "Balancing Group Definition" will allow the regular expression engine to act as a PDA. As described above properly balanced constructs cannot be described by a regular expression. However, the .NET regular expression engine provides a few constructs that allow balanced constructs to be recognized. (?<group>) - pushes the captured result on the capture stack with the name group. (?<-group>) - pops the top most capture with the name group off the capture stack. (? (group)yes|no) - matches the yes part if there exists a group with the name group otherwise matches no part. These constructs allow for a .NET regular expression to emulate a restricted PDA by essentially allowing simple versions of the stack operations: push, pop and empty. The simple operations are pretty much equivalent to increment, decrement and compare to zero respectively. This allows for the .NET regular expression engine to recognize a subset of the context-free languages, in particular the ones that only require a simple counter. This in turn allows for the non-traditional .NET regular expressions to recognize individual properly balanced constructs. You can try this at A Better .NET Regular Expression Tester. Lastly, I really enjoyed Jeff Atwood's article: Parsing Html The Cthulhu Way. Funny enough, it cites the answer to this question that currently has over 4k votes. System.Text is not part of C#. It's part of .NET. @C0deH4cker You are correct, the expression should have \s+ instead of \s*. @Scheintod Thank you for the comment. I updated the code. The previous expression failed for self closing tags that had a / somewhere inside which failed for your <img src="images/pic.jpg" /> html. It may not be perfect, but I ran this code through a lot of HTML. Note that it even catches strange things like <a name="badgenerator"">, which show up on the web. or just combine if and if not. To downvoters: This is working code from an actual product. I doubt anyone reading this page will get the impression that it is socially acceptable to use regexes on HTML. Is someone using CDATA inside HTML? Your regex starts fail on the very shortest possible, valid HTML: <!doctype html><title><</title>. Simple '<!doctype html><title><</title>'.match(/<(? :"[^"]*"['"]*|'[^']*'['"]*|‌​[^'">])+>/g) returns ["<!doctype html>", "<title>", "<</title>"] while should ["<title>", "</title>"]. "Is someone using CDATA inside HTML?" - yes, I do. It takes less bytes if you show HTML source code in <pre> tags. There are some nice regexes for replacing HTML with BBCode here. For all you nay-sayers, note that he's not trying to fully parse HTML, just to sanitize it. He can probably afford to kill off tags that his simple "parser" can't understand. I suggest using QueryPath for parsing XML and HTML in PHP. It's basically much the same syntax as jQuery, only it's on the server side. @RobG Actually jQuery uses the DOM, not the built-in parser. \s*: it may have whitespaces before tag name (ugly but possible). (\w+): tags can contain letters and numbers (h1). Well, \w also matches '_', but it does not hurt I guess. If curious use ([a-zA-Z0-9]+) instead. @GlitchMr, that was his point. Modern regular expressions are not technically regular, nor is there any reason for them to be. @alanaktion: The "modern" regular expressions (read: with Perl extensions) cannot match within O(MN) (M being regular expression length, N being text length). Backreferences are one of causes of that. The implementation in awk doesn't have backreferences and matches everything within O(MN) time. About the question of the RegExp methods to parse (x)HTML, the answer to all of the ones who spoke about some limits is: you have not been trained enough to rule the force of this powerful weapon, since NOBODY here spoke about recursion. A RegExp-agnostic colleague notified me this discussion, which is not certainly the first on the web about this old and hot topic. After reading some posts, the first thing I did was looking for the "?R" string in this thread. The second was to search about "recursion". No, holy cow, no match found. Since nobody mentioned the main mechanism a parser is built onto, I was soon aware that nobody got the point. If an (x)HTML parser needs recursion, a RegExp parser without recursion is not enough for the purpose. It's a simple construct. It's written as a PHP string, so the "s" modifier makes classes include newlines. (Take care, in that note I wrongly used the "m" modifier; it should be erased, notwithstanding it is discarded by the RegExp engine, since no ^ or $ anchorage was used). although corrupted (x)HTML does not drive into severe errors, it is not sanitized. Anyhow it is only a RegExp pattern, but it discloses the possibility to develop of a lot of powerful implementations. I wrote this pattern to power the recursive descent parser of a template engine I built in my framework, and performances are really great, both in execution times or in memory usage (nothing to do with other template engines which use the same syntax). If you put something like that in production code, you would likely be shot by the maintainer. A jury would never convict him. @Gareth: thanks for your objection, but are you sure that putting a greater-than inside an attribute is a valid code? Well, also if not, this evidences another limit to add to the ones I listed above in case to create a greed parser for the real world... But it is not too much to demonstrate the way is not good, do you agree? There are other useful operators in RegExp which allow to check for next occurrences, this should be a proper use for them. @Bart K.: it is valid only in an HTML 4- document. XHTML documents need the five XML entities encoded. If your comments are aimed to nothing but criticize, I see no good results this discussion may reach. I was the first to say that my solution has some limits, but of course I am available to listen anyone who can help me in improving it. I posted something which costed me time and work, and which results are effective in a number of projects up and running. I thought it could help, proposing the way of a RegExp solution which nobody nearly spoke about (recursion), and which is the only way to parse nested markup patterns (through RegExp, of course). Regular expressions can't work because by definition they are not recursive. Adding a recursive operator to regular expressions basically makes a CFG only with poorer syntax. Why not use something designed to be recursive in the first place rather than violently insert recursion into something already overflowing with extraneous functionality? You are right, the lesser-than only is not valid inside XML attributes. Thanks to your criticism, I implemented my solution so that it can parse anything inside the attributes :) Beside this, I implemented the parsing of XML prologue, DTDs and CDATA. The only upset is that the mod closed the possibility to answer this discussion for users with less than 10 points, so that I cannot post it. I twitted him the request to unlock it, but had no response. Come to me, enemies, I wait you! :) The more you are, the stronger I become! Chuck Norris would be able to parse all of you! It's called htmlsplit, splits the HTML into lines, with one tag or chunk of text on each line. The lines can then be processed further with other text tools and scripts, such as grep, sed, Perl, etc. I'm not even joking :) Enjoy. It is simple enough to rejig my slurp-everything-first Perl script into a nice streaming thing, if you wish to process enormous web pages. But it's not really necessary. I bet I will get downvoted for this. They are good for XML / XHTML. With minor variations, it can cope with messy HTML... or convert the HTML -> XHTML first. The best way to write regular expressions is in the Lex / Yacc style, not as opaque one-liners or commented multi-line monstrosities. I didn't do that here, yet; these ones barely need it. "I don't attempt to parse idiot HTML that is deliberately broken." How does your code know the difference? Well it doesn't matter much if the HTML is broken or not. The thing will still split HTML into tags and text. The only thing that could foul it up is if people include unescaped < or > characters in text or attributes. In practise, my tiny HTML splitter works well. I don't need an enormous monstrosity chock full of heuristics. Simple solutions are not for everyone...! I added some simpler regexps for extracting tags, text, and attributes, for XML / XHTML. (get attributes bug 1) /(\w+)="(.*? )"/ assumes double quotes. It will miss values in single quotes. In html version 4 and earlier unquoted value is allowed, if it is a simple word. (get attributes bug 2) /(\w+)="(.*? )"/ may falsely match text that looks like an attribute within an attribute, e.g. <img title="Nope down='up' for aussies" src="..." />. If applied globally, it will also match such things in ordinary text or in html comments. (get attributes bug 3) /(\w+)="(.*? )"/ Optional whitespace should be allowed around the equal sign. (html split bug 1) s/>/>\n/g Since ">" is allowed in data, this may split text lines and confuse subsequent processing. @DavidAndersson, as I said above those regexps are for XML / XHTML, which has a more strict syntax and is easier to parse. If you want a "perfect" parser that can cope with any difficult or malformed HTML input, maybe it's better not to use regexps. But I've found that regexps are more than sufficient for all the html processing tasks I have ever needed to do, and if they don't work for some reason I can tweak them to make them work. In face regexps can be more flexible with some types of broken html that would be rejected by a fussy parser. Have you tried using an XML parser instead? This post is locked to prevent inappropriate edits to its content. The post looks exactly as it is supposed to look - there are no problems with its content. Please do not flag it for our attention. Kobi: I think it's time for me to quit the post of Assistant Don't Parse HTML With Regex Officer. No matter how many times we say it, they won't stop coming every day... every hour even. It is a lost cause, which someone else can fight for a bit. So go on, parse HTML with regex, if you must. It's only broken code, not life and death. Is it possible to use RegEx to parse this answer? Follow the var links for QName, S, and Attribute to get a clearer picture. Based on that you can create a pretty good regexp to handle things like stripping tags. It is said that if you know your enemies and know yourself, you can win a hundred battles without a single loss. If you only know yourself, but not your opponent, you may win or may lose. If you know neither yourself nor your enemy, you will always endanger yourself. In this case your enemy is HTML and you are either yourself or regex. You might even be Perl with irregular regex. Know HTML. Know yourself. I have composed a haiku describing the nature of HTML. I have also composed a haiku describing the nature of regex in Perl. And that could be tested here. And the pattern I used is going to adhere these rules. This expression will work for many element names, however, the XML spec uses letter in the Unicode sense. There are legitimate element names which this won't match. @AlanMoore href attribute with no slashes: href="some_other_page.html"
It's true that when programming it's usually best to use dedicated parsers and APIs instead of regular expressions when dealing with HTML, especially if accuracy is paramount (e.g., if your processing might have security implications). However, I don’t ascribe to a dogmatic view that XML-style markup should never be processed with regular expressions. There are cases when regular expressions are a great tool for the job, such as when making one-time edits in a text editor, fixing broken XML files, or dealing with file formats that look like but aren’t quite XML. There are some issues to be aware of, but they're not insurmountable or even necessarily relevant. A simple regex like <([^>"']|"[^"]*"|'[^']*')*> is usually good enough, in cases such as those I just mentioned. It's a naive solution, all things considered, but it does correctly allow unencoded > symbols in attribute values. If you're looking for, e.g., a table tag, you could adapt it as </?table\b([^>"']|"[^"]*"|'[^']*')*>. Granted, these don't account for surrounding context and a few edge cases, but even such things could be dealt with if you really wanted to (e.g., by searching between the matches of another regex). At the end of the day, use the most appropriate tool for the job, even in the cases when that tool happens to be a regex. You want the first > not preceded by a /. Look here for details on how to do that. It's referred to as negative lookbehind. Can you provide a little more information on the problem you're trying to solve? Are you iterating through tags programatically? Yep, I sure am. Determining all the tags that are currently open, then compare that against the closed tags in a separate array. RegEx hurts my brain. The PHP DOM functions won't work properly unless it is properly formatted XML. No matter how much better their use is for the rest of mankind. I have never used querypath, so can't comment on its usefulness. Another one to try is my DOMParser which is very light on resources and I've been using happily for a while. Simple to learn & powerful. For Python and Java, similar links were posted. For the downvoters - I only wrote my class when the XML parsers proved unable to withstand real use. Religious downvoting just prevents useful answers from being posted - keep things within perspective of the question, please. The OP doesn't seem to say what he needs to do with the tags. For example, does he need to extract inner text, or just examine the tags? I'm firmly in the camp that says RegEx is not the be-all, end-all text parser. I've written a large amount of text-parsing code including this code to parse HTML tags. While it's true I'm not all that great with RegEx, I consider regular expressions just too rigid and hard to maintain for this sort of parsing. If you only want the tag names it should be possible to do this via regex. should do what you need. But I think the solution of "moritz" is already fine. I didn't see it in the beginning. For all downvoters: In some cases it just makes sense to use regex, because it can be the easiest and quickest solution. I agree that in general you should not parse HTML with regex. But regex can be a very powerful tool when you have a subset of HTML where you know the format and you just want to extract some values. I did that hundreds of times and almost always achieved what I wanted. No you can’t parse HTML with regex. But for some subsets, it may work. Although it's not suitable and effective to use regular expressions for that purpose sometimes regular expressions provide quick solutions for simple match problems and in my view it's not that horrbile to use regular expressions for trivial works. There is a definitive blog post about matching innermost HTML elements written by Steven Levithan. As many people have already pointed out, HTML is not a regular language which can make it very difficult to parse. My solution to this is to turn it into a regular language using a tidy program and then to use an XML parser to consume the results. There are a lot of good options for this. My program is written using Java with the jtidy library to turn the HTML into XML and then Jaxen to xpath into the result. While the answers that you can't parse HTML with regexes are correct, they don't apply here. The OP just wants to parse one HTML tag with regexes, and that is something that can be done with a regular expression. If you add something to the regex, by backtracking it can be forced to match silly things like <a >>, [^/] is too permissive. Also note that <space>*[^/]* is redundant, because the [^/]* can also match spaces. Where (?<! ... ) is (in Perl regexes) the negative look-behind. It reads "a <, then a word, then anything that's not a >, the last of which may not be a /, followed by >". Note that this allows things like <a/ > (just like the original regex), so if you want something more restrictive, you need to build a regex to match attribute pairs separated by spaces. +1 for noting that the question is not about parsing full (X)HTML, it's about matching (X)HTML open tags. Something else most of the answers seem to ignore, is that an HTML parser can very well use regular expressions in its implementation for parts of HTML, and I would be surprised if most parsers didn't do this. @Thayne Exactly. When parsing individual tags, a regular expression is the right tool for the job. It is quite ridiculous that one has to scroll halfway down the page to find a reasonable answer. The accepted answer is incorrect because it mixes up lexing and parsing. The answer given here will fail when an attribute value contains a '>' or '/' character. This will work incorrectly on HTML containing comments or CData sections. It will also not work correctly if a quoted attribute contains a > character. I agree what OP suggest can be done with a regex, but the one presented here is far to simplistic. It is similar to yours, but the last > must not be after a slash, and also accepts h1. That is very true, and I did think about it, but I assumed the > symbol is properly escaped to &gt;. @Kobi: what does the exlamation mark (the one you placed tpward the end) mean in a regexp? This also matches <!-- some comment -->.